Around October, there’s no shortage of mildly spooky films aimed at a younger democratic. Such films include “Coraline”, “Ghostbusters”, “Monster House”, and heck, many kids in the 90’s grew up with “Beetlejuice”. All of these films have their creepy elements throughout and are basically a staple of the holiday season. 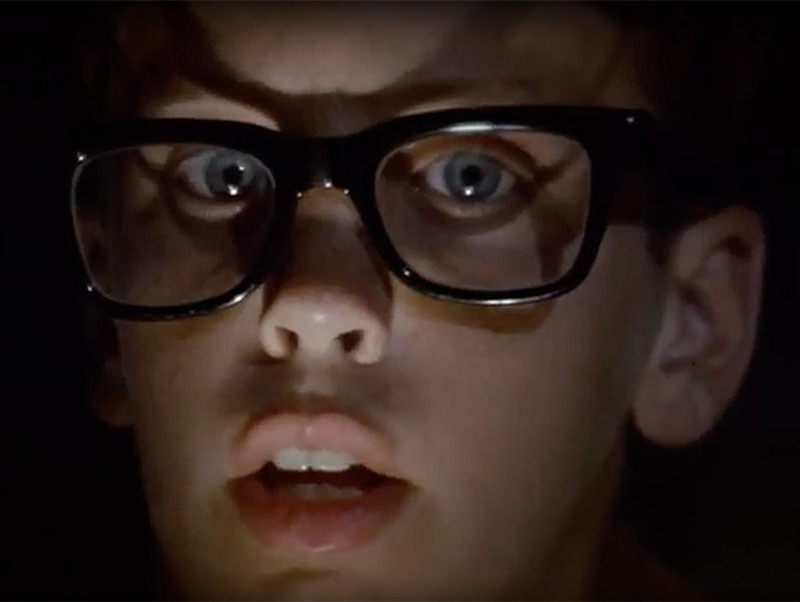 However, what I loved most as a kid were the sudden scary moments that came from seemingly lighthearted and whimsical family films. It’s hard to describe, but classic family and children’s films always felt a little more complete with just a little pinch of scary content. 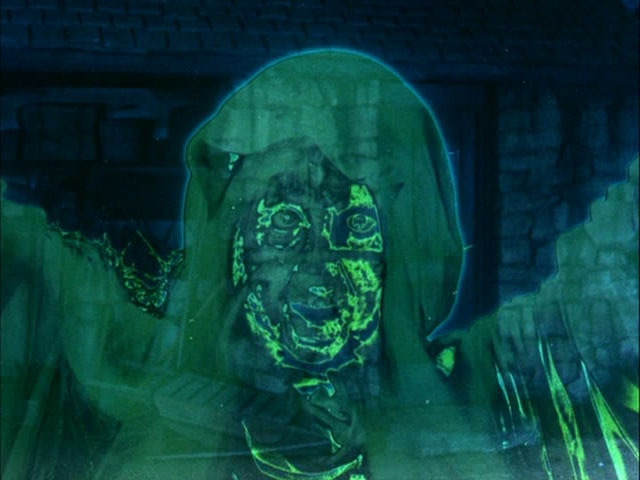 So, for this countdown, I’ll be highlighting my own personal favorite spooky moments from otherwise bright and colorful family films. 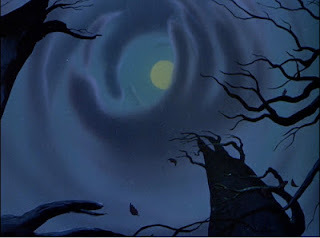 This is the textbook definition of a scary scene existing in a family film just for the sake of a random spooky scene, and in my opinion it’s all the better for it. The story of a young boy who takes a tour of an enchanted candy factory was one of my childhood favorites, as it just seemed to have everything I loved in one package. 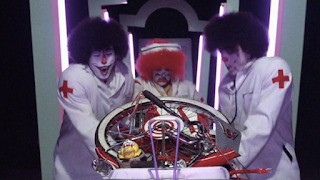 It had inventive craziness, whimsical enchantment, exciting situations, playfully comedic moments, and a well-placed, if completely random scary tunnel scene acting as a cheery on top. During the tour of Wonda’s factory, the guests take a seemingly peaceful ride on a ferry that’s calmly sailing a chocolate river. Then it literally takes a dark turn down a mysterious tunnel, full of neon lights, warped visuals, and all kinds of random nightmare imagery that’s terrifying the passengers. We get images of a Snake crawling over someone’s face, tense eyeball closeups, dark suited men, and a chicken getting its head cut off. The thing I love most about this scene is just how abruptly it starts, and then stops, like it was completely pointless, but that’s what makes it great. It didn’t add anything thing to the narrative or story and solely exists as a random yet unforgettable spooky highlight. One of my fondest childhood treasures is this nostalgic, coming of age, sports adventure. 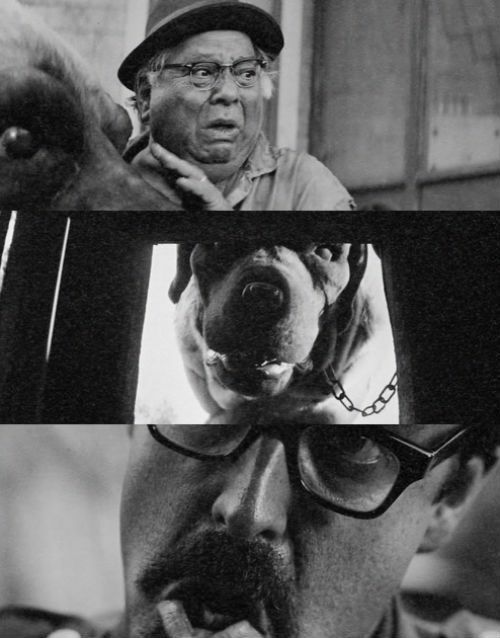 The film revolves around a young boy’s summer, the new friends he makes, their favorite sport, and an urban legend revolving around a neighbor’s monstrous dog that may or may not have eaten a kid. 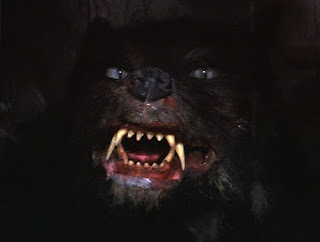 One night when telling stories during a sleepover, one of the kids tells the legend of the Beast, and how the origin of this intimidating dog took shape. As he tells the tale, the film suddenly materializes into a choppy, black and white flashback, with creature effects that look like they came from out of the 1940’s. Yet, despite it’s cheap aesthetic and goofy tone, this scene boasts an eerie atmosphere, and the boys voice adds some intimidation to the stories context. Of course, we all get a big laugh from the over emphasized “FOREVER”, but for me, the real highlight is what follows just after the tale concludes. 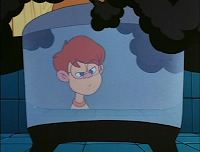 One of the boys doubts this story, which results in the other kids forcing him to look out their clubhouse window, and into the ruined backyard where the beast dwells. Even though nothing physically appears on screen, I’ll never forget that frightening tracking-shot through the trashed yard, which picks up rapidly in speed, with the music and sound design building, and reaching back to the boys terrified reaction of something dangerous down there. It was all around an effectively spooky moment, and a great way to close a night of creepy tales. 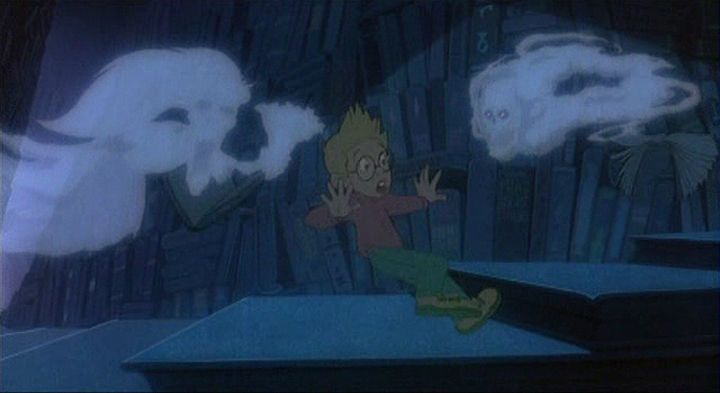 This animated, early 90’s fantasy adventure follows a young boy as he travels through an enchanted library, and every section becomes a magical world in of itself. We see the mid-evil section, the high sailing adventure section, the fantasy section, and my own personal favorite is when our young hero and his friends get lost in the horror section of the library. In this maze of cemeteries, and creepy houses, the team encounter some of the darker books of famous literature. They get chassed by The Hound of Baskerville, a black bird sours overhead screeching “Nevermore” (a reference to “The Raven” by Edgar Allan Poe), and numerous other Ghost Stories come to life. The most thrilling encounter being Doctor Jekyll and his evil other half Mr. Hyde. This was actually my very first introduction to the character, and while it did a lousy job fleshing him out as a literary icon, it still made for a memorable spooky moment that left an impression on my youth. 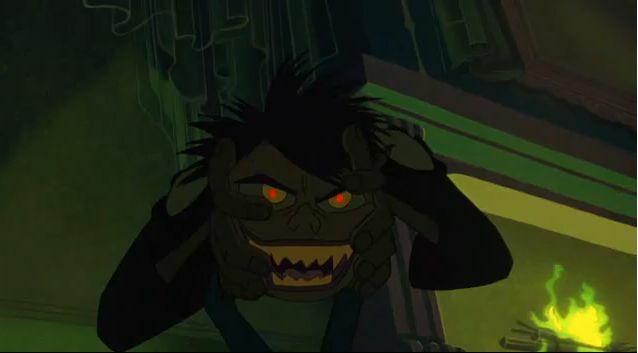 Now, whenever I think of Mr. Hyde, it’s this brief appearance of him in “The Pagemaster” that always comes to mind first. 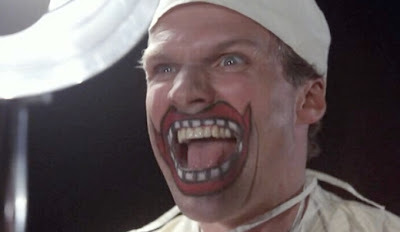 #7 Spooky Clown Dream from "Pee-Wee's Big Adventure"
So what are some things that can genuinely scare children, or heck even grown adults to timid to admit it? Well, hospitals have always had a spooky edge to them, especially when you’re a little kid. Clowns in general can be seen as creepy and have even developed phobias in certain people. Oh, and Hell is quiet terrifying. So, why not combine all that together in one spooky package, like the frightening nightmare sequence in “Pee-Wee's Big Adventure”. Tim Burton directed this lighthearted little comedy about a silly man trying to find his lost bike, but it’s this short little nightmare sequence in which his twisted talents really shine. 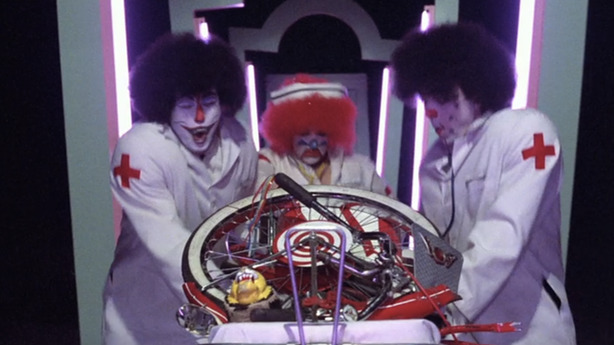 Basically, all of Pee-Wee's warped memories of his travels, and fear of retrieving his bike culminate into a nightmare with evil clowns dressed as doctors disassembling his bike, and Devils dancing with glee around a fire while offering it as a sacrifice. The scene is gorgeous, with pitch black backdrops, colorful objects in the foreground and all kinds of warped designs on display. Nightmares in general always make for a great excuse for a spooky scene in a family friendly film, and while this certainly won’t be the last one on my countdown, it does still make for creative nightmare fuel. It was Walt Disney’s very first movie, and I think most people look back on it as this pleasant, magical, and completely lighthearted experience. In truth, “Snow White and the Seven Dwarfs” contains some of the greatest spooky visuals and creepy moments from any animated family film. This admittedly was always one of my favorites of the Disney Princess films, and while I watched it for many select highlights, my absolute favorite scene was always when Snow White went running into the woods, and her frightened imagination transforms the setting into a nightmarish land full of scary monsters. The designs and imagery on display are all awesome, but what really made the scene so effective is just seeing one of Disney’s cutest princesses caught in the middle of all this horror. It’s just not a common place to see a Disney princess in an eerie situation of this sort. The only other exception I can think of is an episode of “The Little Mermaid” titled “Charmed”. 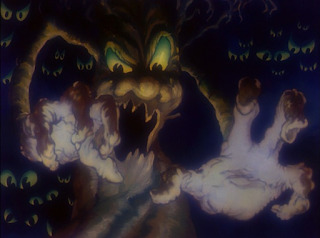 This featured princess Arial lost in a cave encountering all kinds of nightmarish creatures, and I wouldn’t be surprised if it got its inspiration from the dark forest scene in “Snow White and the Seven Dwarfs”. 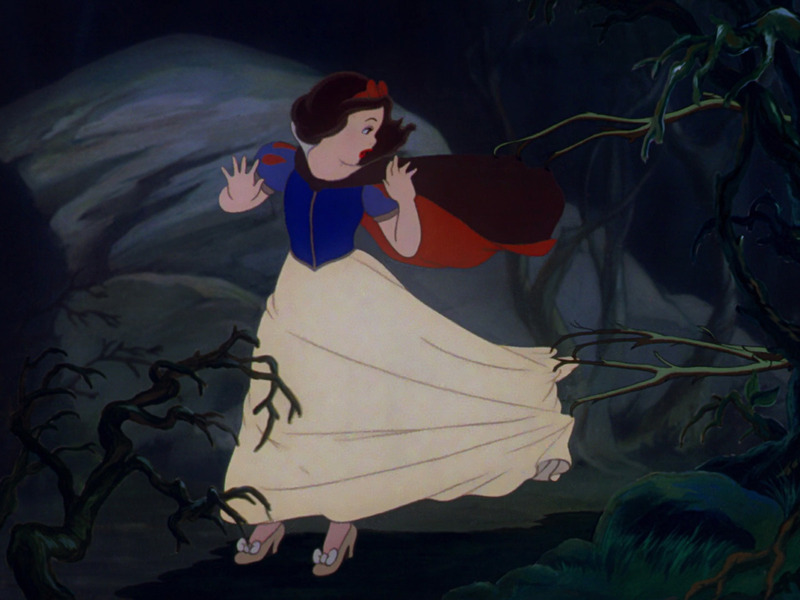 Bottom line, creepy visuals are always great, but throw a pretty Disney princess in the mix, and the situation suddenly becomes all the more terrifying. Now this late 1950’s Disney film is personally my favorite movie to watch on St. Patrick’s Day, as it’s over flowing with Irish lore, it’s bright, colorful, has lovable characters, over the top dance numbers, and just puts me in the holiday mood every time I watch it. 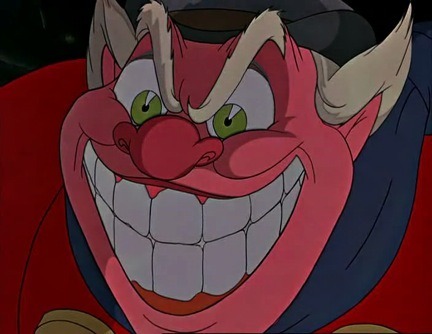 Who would guess that such a seemingly sweet and magical Disney film would contain such awesome, frightening content. 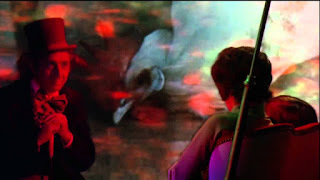 While the first two acts of the film are so light hearted and colorful, things take a sudden dark turn at the start of the third act. Katie, who’s the doubter of the films lead Darby O’ Gill, has a sudden accident, and finds herself at deaths door. This beacons the arrival of several ghostly apparitions looking to claim her soul. 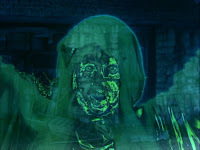 Now, of course this is an Irish fairy tale, so we need to have a “banshee”, and this is the big show steal-er by far. For a creature effect from 1959, the banshee looks amazing, even to this day. She moves very gracefully, has long skeleton hands, and most of the time her face is concealed under a hood. 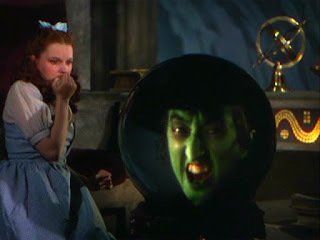 We do eventually see her face and when we do, holly cow is it cool. 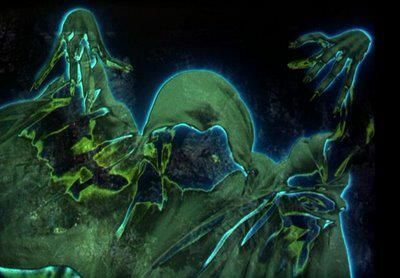 The Banshee is one of the big elements that make this film so memorable, as there really weren’t too many Disney movies at the time which featured something this creepy and awesome. 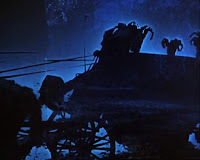 However, the Banshee is only the warm up, as there’s a spectral horse drawn carriage called The Death Coach. 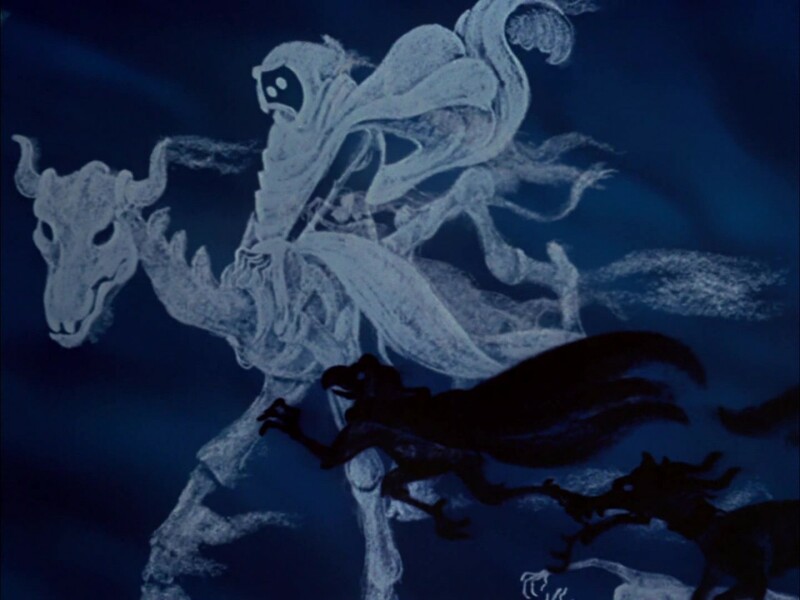 The driver looks like the Headless horseman, only transparent. 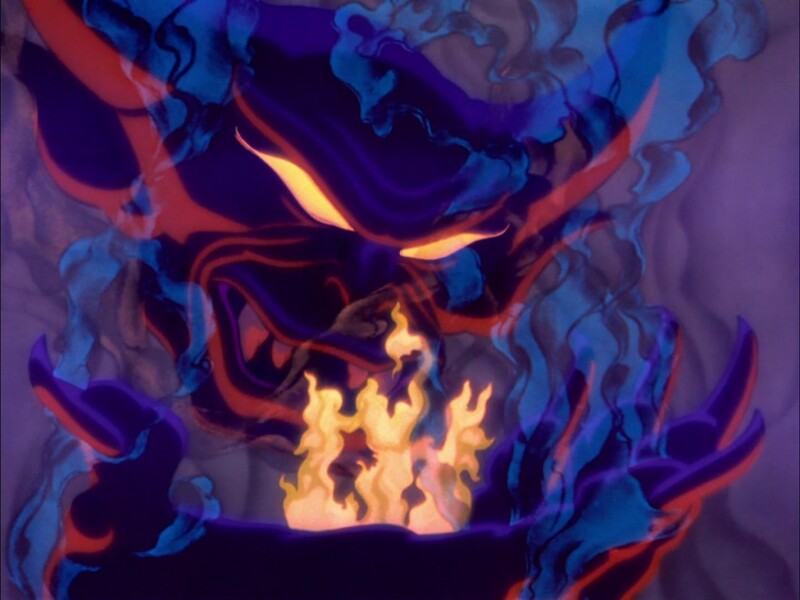 Seeing this thing come down with an intent to claim the soul of Darby’s doubter is quite eerie for a kid’s film, and it further cements this as one of Disney’s darkest movie moments. One of the lesser known titles under the Disney banner, but for those of us who grew up with it, we still remember … just how dark and depressing the film occasionally got. Who would think a movie about cute house hold appliances finding their master could be so intense, but it is, and it’s the toasters nightmare sequence that’s always stuck with me. It starts off just a normal, cheerful breakfast with a little boy making himself a sandwich. Then things take a dark turn when his toast starts burning in the toaster. The smoke emerges, taking the form of a monster hand, which takes the boy far away and leaves our little toaster all alone. That by itself was honestly unseating enough, but things only get worse when the fire brigade arrive. The catch is that the fireman has taken the form of a demonic looking clown, and if there’s one point that “Pee-Wee’s Big Adventure” didn’t already hit home, it’s that scary clowns are nightmare fuel. I wasn’t even a kid with any kind of clown paranoia, but that evil looking clown scared the piss out of me back when I was a child. Actually, it’s still creepy, even as an adult. The remainder of the dream has some artsy animation, but it’s not like you’re paying attention, not after seeing that frightening thing. Now here’s a gem from my childhood, and to this day I view “Fantasia” as a powerhouse of art that combines beautiful artistry with classical music and creates visual poetry in the Process. Of course, the final segment of “Fantasia” titled “A Night on Balk Mountain” stands out as not only one of Disney’s darkest moments, but generally one of the darkest moments that any family film has ever contained. 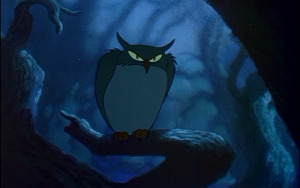 I can’t even express in words how terrifying this was to see as a little kid. It shocked me, but it also thrilled me, and I kept coming back for more. Its scary right from the start, with that painting of the mountain, all that green lighting and the chilling silence … it draws you in immediately. 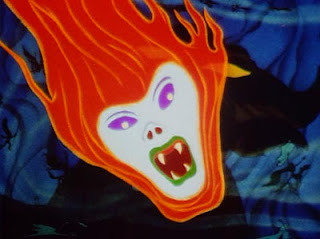 Then that creepy music begins to build up, the demonic villain takes center stage, and throughout the remainder of the cartoon, we get shadows engulfing towns, cemeteries, creepy imagery, phantoms floating all over the place, demonic creatures dancing around flames, and all kinds of unspeakable, terrifying creatures just leaping at the screen … it’s awesome. I remember being 4 years old and running behind my couch because I was so scared that those things would leap out of my TV screen. 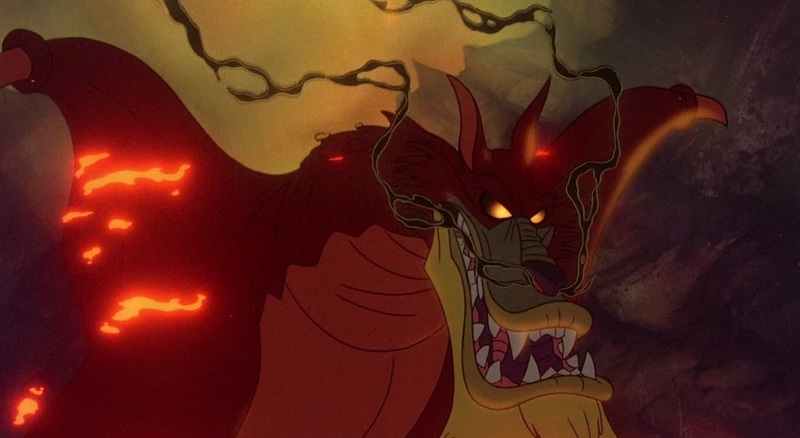 But the big show steal-er of this whole sequence is the demonic villain named Chernabog, and while his name isn’t very well known, everyone remembers what he looks like. In fact, he’s gone on to become one of the most well know and popular Disney villains in his own unique way. 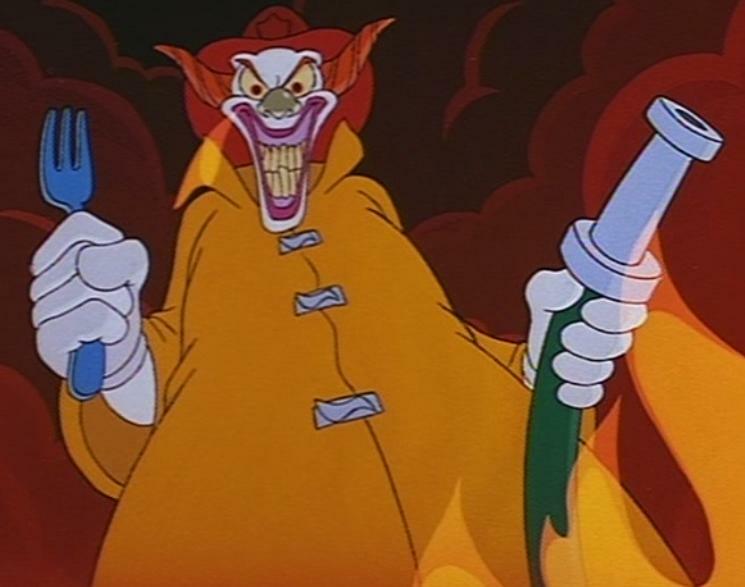 I’ll certainly say this, of all the animated villains to come from Disney, none of them terrified me quiet as much as this guy. Those evil eyes and wicked smile always came back to haunt my dreams. The whole sequence itself is the stuff of nightmares for kids, but now I make it a tradition to watch this short every Halloween. This was a very ambitious, yet very controversial children’s movie, featuring themes and subjects that are very adult for an animated kids film. It also makes great use of one of the most frightening nightmare sequences ever seen on film. As our hero named Charlie cheats his own death, he’s told he’ll never be able to inter heaven, leading to one inevitable conclusion … when his time runs out, he’ll be going to hell. There’s no subtlety in what kind of demonic imagery appears in this dream, including fiery brimstone, violent monsters, scary faces, lakes of lava, and it’s all really intense, but awesome. It could have been so easy for the animators to rely on goofy cartoon devils, especially sense this is a movie about talking dogs, but I really admire them for going the extra mile. It’s a chilling nightmare, as well as a metaphor of why one should aim for heaven, because when you fall … you fall down the fiery pit. 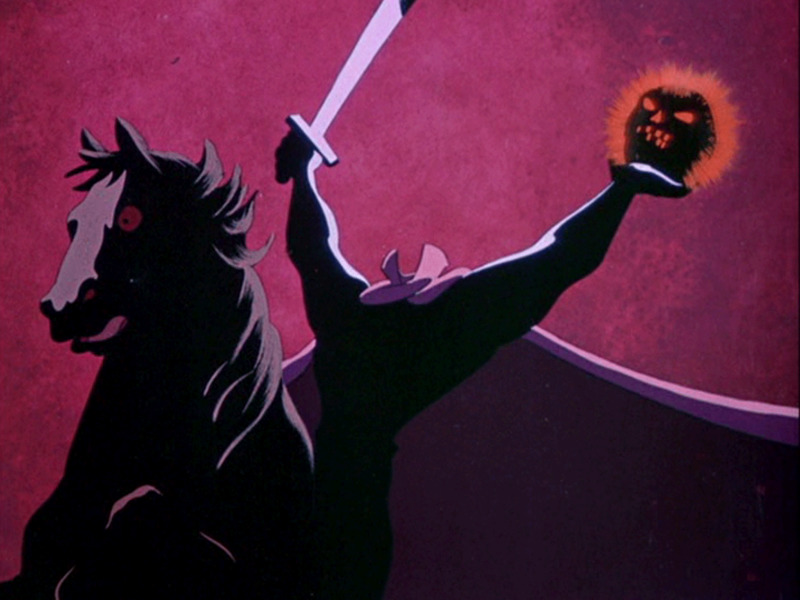 Another underappreciated Disney film, but probably best known for an exciting sequence involving a headless horseman. Yes, the films climactic headless horseman chase is awesome, even the villain himself is an iconic scary figure, but he’s not my favorite thing about the movie. 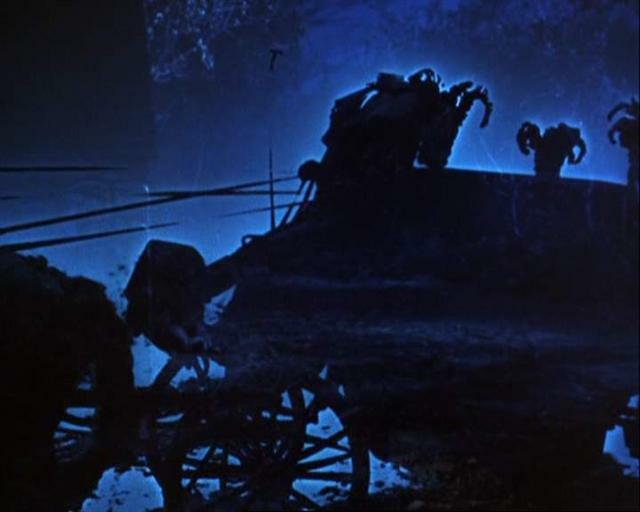 Oh no, for me, the real spooky highlight of the film, and personally my favorite creepy sequence in any family movie is the slow buildup to when we meet the Headless Horseman. 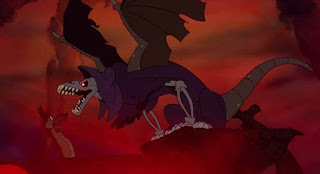 This scene of Ichabod riding by himself in the woods is one of the strongest, scariest and most atmospheric scenes to ever be experienced in an animated feature. Interesting that I find it more exciting when the scene is just establishing a mood as opposed to showing off the scary monster. We’ve all had times when we felt dismal, frightened, and alone in the dark, we hear strange sounds and we get an uncomfortable feeling that there’s something lurking in the shadows, so we try to convince ourselves that it’s just the wind or an animal, but you just don’t know for sure. Never before has that feeling been captured so well on screen then in this scene. We see him begin to panic at the sounds of frogs, owls and crickets, all while the narrator gives frightening detail of how the forest seems to close in behind him and consume him whole. 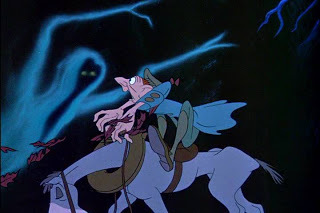 Unlike the over the top monster designs of Snow Whites venture in the dark forest, or the creatures from Fantasia’s Night on Bald Mountain, this sequence keeps the designs simple, and only sparingly shows creepy imagery, that way it really pops when something appears on screen. I’ll never forget that awesome image of the full moon, and what looks like an evil hand closing around it. This scene is almost like a simulation, putting you in his place, and making you feel the fear, adrenaline and anxiety that something evil or dangerous might be out there waiting to strike. 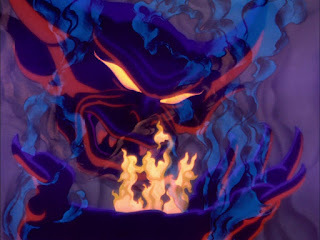 As a child, I could never watch this scene by myself, and it’s personally one of my favorite moments from any Disney movie.